Traditional brownies with a delicious Christmas twist! 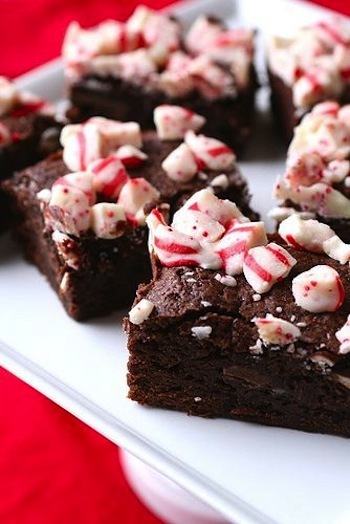 For the peppermint lovers out there, this recipe conjures the most sinfully delectable, chewy, chocolate-y, festive, peppermint brownies that are perfect for that holiday party you’re about to host (or just to satisfy your craving sweet tooth!). This is a recipe that I have personally altered specifically for the Christmas season, and I promise you, it won’t disappoint! Begin with my simple recipe for chewy chocolate brownies (you could also decide to use your favourate chocolate brownie recipe instead) and incorporate 1½ tablespoons of good quality peppermint extract into the batter for a Christmassy twist! This will echo the crushed peppermint garnish you will be sprinkling on top of the brownies once they have been baked for the perfect Christmas treat. 1) Preheat your oven to 180C and line your baking tin with parchment paper to ensure that your brownie does not stick to the pan. 2) Fill a zip-lock bag halfway with peppermint candies or candy canes and close the bag tight. Then, with a rolling pin, start beating the candies until they become coarse pieces. You don’t want to turn it into powder, as you want to be able to still see the festive white and red (and sometimes green) colours of the candy on top of your brownie. 3) Over medium-low heat, gently melt in the butter and chocolate chips in a saucepan until they have both melted and combined. Remember to stir continuously to ensure that the chocolate does not burn (if you are unconfident about this stage, melt the chocolate and butter in a bain-marie (simply put a heat-proof bowl over a pot of hot water and melt the chocolate in the bowl, however making sure that the base of the bowl does not touch the hot water)). 3) Once the chocolate and butter have melted, turn off the heat and leave to cool for about 1-2 minutes. 4) Once the chocolate has cooled a bit, crack in the 2 large eggs into the pot one at a time and whisk each egg rigorously to ensure that the egg does not scramble inside the chocolate mixture. 5) Next, pour in the vanilla and peppermint extract and stir to combine. 6) Add in all the dry ingredients and combine well. 7) Pour the batter into your prepared baking tin and spread it evenly. Bake the brownies for 40 minutes (or until a toothpick inserted into it comes out clean), rotating the pan after 20 minutes for more even cooking. 8) Once they are out of the oven, leave to cool on a cooling rack for 2 minutes and then quickly sprinkle the crushed peppermint bits on top. Leave to cool completely before serving.